WARNING: This product can expose you to chemicals including paraffin oils, which is known to the State of California to cause cancer and birth defects or other reproductive harm. For more information go to www.P65Warnings.ca.gov. A unique aerial adjuvant technology specifically developed to deliver improved drift control, deposition and coverage when applied through high-speed aerial application equipment. 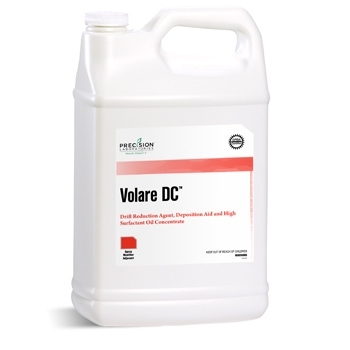 Volare DC optimizes droplet size and deposition by “right-sizing” spray droplets to resist wind stream shear that ruptures oversized droplets formed from ordinary drift retardants. Specifically formulated for aerial application. Delivers improved drift control, deposition and coverage in a single unique formulation. Easy-to-use, nonpolymeric technology that won’t gel or thicken spray solutions. Significantly outperforms ordinary drift retardants. Convenient, low-use-rate of 2–4 pints/100 gal.